A part of the roof of the former Sidra Pino bottling plant, located on 63rd by 72nd streets in the center of Mérida, collapsed because of the intense rain that fell Tuesday July 4. 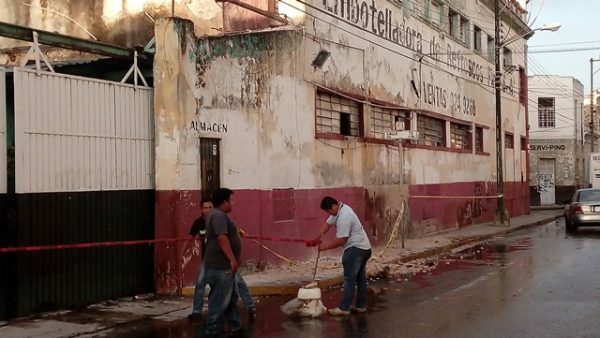 This was the second building collapse in Merida’s centro historico in the past two weeks caused by effects of heavy rains and high humidity on deteriorating structures. Tuesday’s incident was reported to have occurred about 5 p.m. after a side of the tallest part of the old building of more than five meters fell on the sidewalk. No injuries were reported. The collapse caused electric power cables to break leaving some streets without lights. Police officers at the scene placed caution tape on the stones and debris that ended up on the ground to protect passers-by. City Civil Protection inspectors also arrived, and they cordoned off the site in a larger area as a preventive measure. The building was abandoned in 2011, when the Yucatecan bottler declared bankruptcy and decided to close the plant. The closure generated labor litigation with employees, who for five years were asking for their severances. Just last year, an agreement was reached between the owners of the Sidra Pino and the workers’ union so that they returned the facilities they had taken some time ago, although the property looks in a deplorable state. For his part, the director of Urban Development, Aref Karam Espositos, reported that his staff took notice of the detachment of a part of the cornice of the facade. The official added that Municipal Civil Protection and firefighters from the SSP (Public Safety Secretariat) cordoned off the site and that there were no injuries due to the incident. 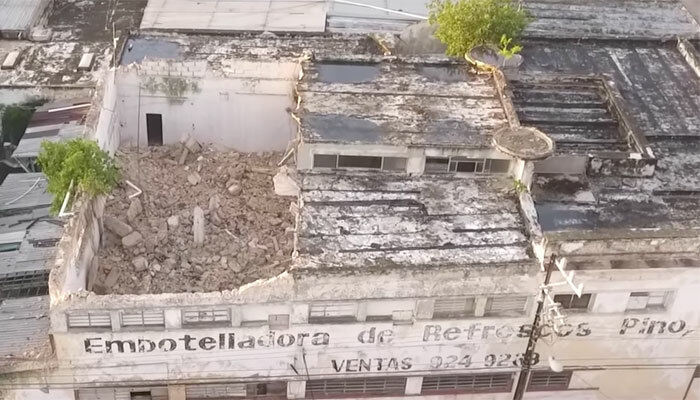 Karam Espósitos pointed out that Public Works staff will make a risk assessment of the structure since it is reported that a piece of the cornice fell onto the public road and other possible damages that could have been registered. 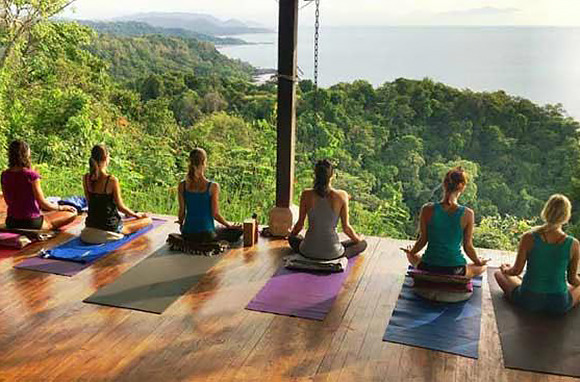 As a result of this opinion, the corresponding legal procedures will be carried out in coordination with the National Institute of Anthropology and History (INAH) and the CFE (Federal Electricity Commission) in order to safeguard the safety of citizens. The director of the Municipal Police, Arturo Romero Escalante, reported that the street was reopened to traffic shortly after 8 pm. An inspection of the building by city officials and owners was scheduled for Wednesday July 5.